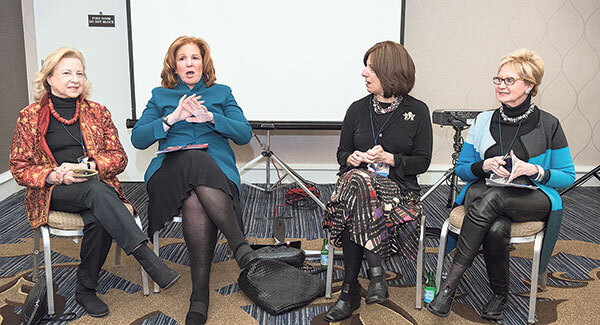 Participating in the “Where Are All The Women Leaders?” panel at Limmud FSU April 3 are, from left, Colette Avital, Susan Stern, Lori Palatnik, and Sandra Cahn. Israel’s Kiev-born, Milwaukee-raised Prime Minister Golda Meir was the Jewish state’s first and only woman premier. An exhibit examining her life and leadership was unveiled at the seventh Limmud FSU conference, an event for Russian-speaking Jews from the New York metropolitan area that drew more than 1,000 participants from around the country, about 100 from New Jersey. The dearth of women’s leadership was a significant theme of the conference, held April 1-3 at the Sheraton Parsippany Hotel. It featured some 100 presenters, including academics, educators, entrepreneurs, journalists, politicians, and artists from the former Soviet Union, Europe, the United States, and Israel. 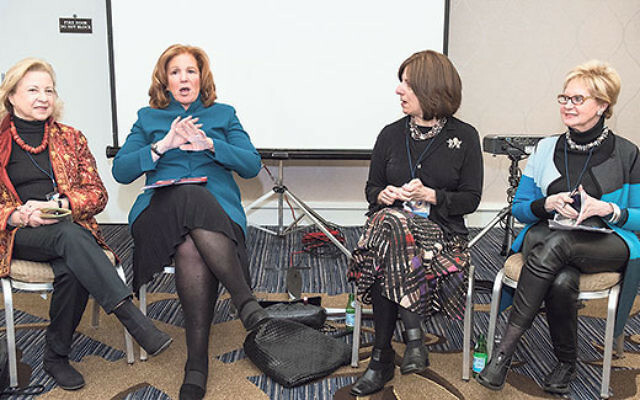 In an interview with NJJN the evening before, Avital, the former Israeli consul general in New York and Knesset House deputy speaker, discussed the progress and room for growth in improving the status of women in Israel. Women are serving as heads of political parties and as ambassadors in the Foreign Ministry. Notably, a woman, Miriam Naor, serves as president of Israel’s Supreme Court, and scientist Ada Yonath was the 2009 Nobel Prize winner in chemistry. “The whole discourse is different,” Avital said. Two factors are holding back women in Israel in society, said Avital. One is the ultra-Orthodox establishment, which determines matters of personal status such as divorce and marriage. The other is the male-dominated Israel Defense Forces, in which women have had limited progress in moving through the ranks. But Avital is encouraged by advances in the area of prevention and punishment of sexual harassment. “Women have spoken out much more” against their perpetrators, and men in top positions — including eight or nine political heads — are losing their jobs for inappropriate acts or comments. And while many more professions are open to women, the discrimination lies more in the wage gap between men and women, which Avital cited as 28 percent, than in the actual hiring process. “The working hours should be more flexible,” she said, noting that more women’s organizations are pushing for such a change. She also said great strides have been made for haredi women, who have entered the workforce — including the high-tech industry — in large numbers. At the Sunday morning discussion on the shortage of women political leaders, Avital and other women panelists focused on the potential positive impact on U.S.-Israel relations of a Hillary Clinton presidency. The panel was moderated by Limmud FSU cofounder Sandra Cahn. Also participating were Lori Palatnik, founding director of the Jewish Women’s Renaissance Project, and Diane Wohl, a philanthropist and Limmud FSU board member.